The UK's cap on immigration threatens the country's future as a centre of scientific excellence, a group of Nobel prize-winning scientists has warned. In a letter to the Times, the eight UK academics said the visa curbs would deprive science and industry of talent. They said it was a "sad reflection" that scientists and engineers could not be afforded the same exception to the rules as Premier League footballers. 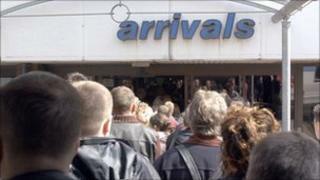 The Home Office said it had consulted widely on the immigration cap. It introduced a limit for work visas for non-EU citizens in June. A key part of the Conservative election manifesto, the temporary cap of 24,100 will be replaced by permanent measures from April 2011. In their letter, the academics wrote: "The government has seen fit to introduce an exception to the rules for Premier League footballers. "It is a sad reflection of our priorities as a nation if we cannot afford the same recognition for elite scientists and engineers." They added: "International collaborations underlie 40% of the UK's scientific output, but would become far more difficult if we were to constrict our borders. "The UK produces nearly 10% of the world's scientific output with only 1% of its population; we punch above our weight because we can engage with excellence wherever it occurs. "The UK must not isolate itself from the increasingly globalised world of research - British science depends on it." The CBI, the Royal Society and university vice-chancellors have already voiced concerns about the immigration cap. Sir Harry Kroto, who won the Nobel Prize in Chemistry told BBC Radio 4's Today programme that one of his own researchers had been refused permission to study at Cambridge University under the rules and will now stay at a US university. "The UK loses out and in the future we can see the UK can only survive on its intellectual property, rather than as a country that provides things, with countries like India and China providing things more cheaply, so we need to look at that," he said. "If one looks over the years, one quarter of the Nobel Prizes that came to the UK were won by immigrants from outside. It's probably very unwise to not look very carefully at the scientists, engineers and technologists who could come to this country and give this country the extra support it needs to compete in the future." Liberal Democrat Business Secretary Vince Cable has said the measure is doing "huge damage" to British firms. Downing Street said the limit would be implemented in a way that still allowed the brightest and best to come to Britain. Minister for Immigration Damian Green said Britain could benefit from migration but not uncontrolled migration. "Britain remains open for business and we will continue to attract and retain the brightest and the best people who can make a real difference to our economic growth, but unlimited migration places unacceptable pressure on public services. "We have consulted with business and other interested parties on how the limit should work and have also asked the Migration Advisory Committee to consult on what the actual limit should be. These consultations are now closed and we will announce the findings in due course." Two of the scientists behind the letter are Russian migrants, Professor Andre Geim and Professor Konstantin Novoselov, of the University of Manchester, who won the Nobel prize for physics on Tuesday. They invented graphene, the world's thinnest material which is 200 times stronger than steel. The other signatories are Sir Paul Nurse, Sir Tim Hunt, Sir Martin Evans, Sir Harry Kroto, Sir John Walker and Sir John Sulston.